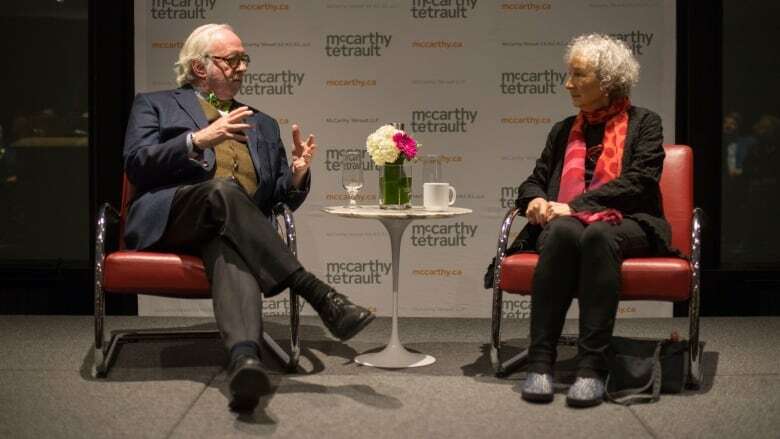 Michael Enright interviewed Margaret Atwood at a fundraiser for The Literary Review of Canada. When The Circle Game won Margaret Atwood a Governor General's Award for poetry in 1966, she had to borrow a dress from a roommate to attend the award function. "I did not have suitable clothing. I did not have such a thing," she told The Sunday Edition's host Michael Enright at a recent fundraiser event for the Literary Review of Canada. When she came back from the event she found her two roommates burning her Hush Puppies. "They felt like these were no longer suitable shoes for an exalted person such as myself to wear," she remembered. She still has the electric typewriter she bought with the $1000 prize money she won from the Govenor General's Award that year. "When the Internet goes down, I'll still have that typewriter," she said. Click 'listen' above to hear why Atwood signed An Edible Woman in a men's socks and underwear department, how she's a prolific procrastinator and why she believes pantyhose is the greatest advance of feminism (hint: it has to do with Twiggy).